As you take another toot off your vape pen or high end mod and as you wave the vapour away from your screen have you ever wondered how the vaping phenomena began? You might think it’s a relatively new ‘invention’ however the very first patent for an ‘e-cigarette’ was filed back in 1963 – or was it? Some say it could date back to the 1930’s – more on that later. Sadly back in the sixties big tobacco companies had a stranglehold [literally] over people and smoking was considered sophisticated and cool – indeed you were considered a bit ‘weird’ if you didn’t smoke. Tobacco advertising was everywhere – literally – with smiling sun tanned doctors promoting their chosen brand – sports events plastered with cigarette sponsorship logos and any suggestion smoking was bad for you was met with derision. I grew up in the sixties where taking the bus to school in the morning meant sitting on a fume filled top deck surrounded by adults puffing on their Park Drives and Players Number 6. Looking back it was a bloody death-trap – a sealed box filled with cigarette smoke that we kids breathed in!!! But cigs were cheap and little if any thought was given to the effects on health – folks smoked it was simple as that. However from the early sixties right up to the modern day the road to the e-cig you are vaping on right now is littered with controversy – dastardly deeds and as you might expect law suits. So let’s take a look at how vaping all began. After graduating from business school in the 50’s and a stint in the armed forces – Herbert worked in his dad’s scrap yard in Pennsylvania. He was a heavy smoker who in a moment of inspiration decided that inhaling smoke surely had to be a bad thing. Quite why this occurred to him is a bit of a mystery – however once the seed had been sown – he set to work on designing an e-cigarette prototype. Taking his inspiration from the oven at his aunt’s bakery and a cup of tea no less – he came to the conclusion he needed flavoured water heated by a battery with the resulting vapour replicating smoke! Ingenious to say the least – and on April 17th 1963 Herbert filed the patent for his Smokeless Non-Tobacco Cigarette – patent number US 3200819 A. The patent was finally published on August 17th 1965 but sadly and despite Herbert’s best efforts he couldn’t find a manufacturer willing to put his invention into production. Herbert believes the few manufacturers that did show an interest decided to wait until the patent expired and produce their own versions – sneaky! None of the original prototypes are still around as they were lost in a fire – kind of ironic really. Decade’s later vaping entrepreneur John David Cameron tracked Herbert down and invited him to join the team behind the Emperor 1963 Original e-cigarettes – now part of Vaporcade. I worked with his team members and used logic to follow my road-map and apply 21st century available technology to it. I will continue to do whatever I can to keep updating the technology and will remain devoted to promoting the 1963’s. Emperor Brand’s goal and my goal are the same. We want to save as many lives as we can. Now a dedicated anti-smoking campaigner and e-cigarette champion Herbert still has a passion to change and save people’s lives through vaping. Back then my wish was to have an alternative to the scourge of tobacco cigarettes. With the e-cigarette market starting to explode, more than ever my dream is rekindled. For this reason, I believe that my partnership with Human Health Organization will save millions of lives every year from cancer and other tobacco-related illnesses, just like I originally hoped. If anyone deserves the Nobel Prize for ‘medicine’ [the closest I can find to the invention of e-cigs] it surely has to be Mr Gilbert. Although some might say that particular accolade should be showered on Chinese pharmacist Hon Lik. If it walks like a duck, has web feet, has a bill, swims in the water, looks like a duck and quacks….it’s a duck. Haha gotta love old Herbert lol. OK a quick Google search of ‘the history of vaping’ places Herbert and Hon Lik as the founding fathers of e-cigarettes so let’s leave it at that. Like Herbert – Hon Lik was a heavy smoker who desperately wanted to quit smoking particularly after his father died from lung cancer. He says that one night after forgetting to remove his nicotine patch [we’ve all been there lol] he had a vivid nightmare in which he was drowning out at sea. Then as if by magic the water transformed into harmless vapor and he was able to breath! All sounds a little bit ‘out there’ to me – but hey if that’s what happened. It was his Eureka Moment and he began working on a series of e-cig prototypes finally releasing the first [official] e-cigarette in 2003. I had a long period of failure. Every day when I woke up I had a new idea on how to improve the device or the material. Every week I was coming up with an improved model. 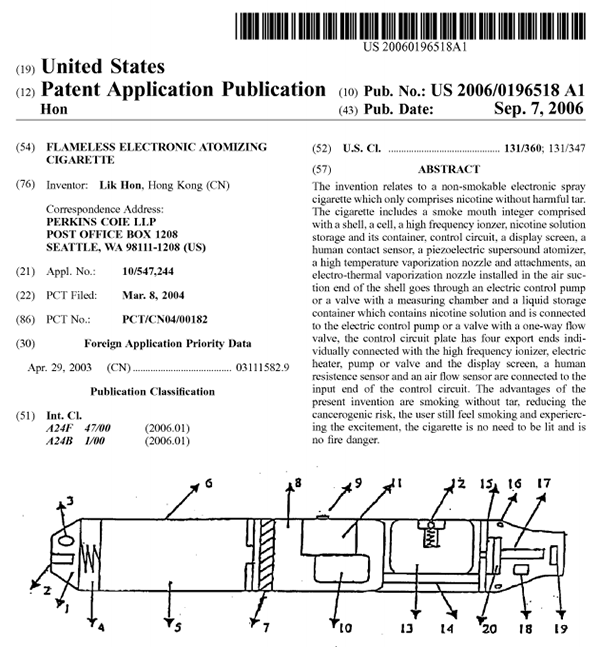 In 2003, I registered the patent in China, the US, and also in the EU. However unlike the vape devices today which rely on a battery to heat the liquid – Hon Lik’s used an ultrasonic atomizer. He launched his company – Dragonite International Limited – and achieved patents in China the US and countries around the world. The company changed its name to Ruyan – which means ‘like smoke’ in Chinese – and was subsequently bought out by Imperial Tobacco in 2013. Far from being a multi-millionaire Hon Lik seems to have spent much of the last few years fighting a succession of court battles to recoup cash he claims to have lost and tackling companies he says have imitated his original patent. Believe it or not and in spite his ‘invention’ of this life saving device we’ve all come to love – he still smokes!!! Most of this time I’m using my e-cigarettes, but as a developer, because there are also new ideas, I cannot lose the sense of taste [for cigarettes]. Sometimes when I find a new [tobacco] product, some kind of a new taste or mix, I will buy one pack and smoke a few cigarettes so I do not lose the sensitivity. Today Hon works for Fontem Ventures [the owners of the Blu e-cig brand] and travels the world promoting vaping as an alternative to smoking [ironic lol]. The Sheikh brothers were running a successful IT company here in the UK when they first became aware of the electronic cigarette. It was 2006 and the UK had just introduced the blanket smoking ban for all public places convincing Umar that then was the time he quit smoking. They had a hunch and despite knowing nothing about the industry they – in their own words – “took a punt” and based themselves in China working with a design and manufacturing team to create the first cartomizer. They instinctively felt this was a pretty clumsy way of delivering nicotine and they set about incorporating the whole thing and the cartomizers as we know them were born. The patent was granted in 2009 and the brothers company Gamucci has gone from strength to strength with an annual turnover of around $8million. We are pioneers who have helped spawn a new industry. I’d just finished researching this when I came across an excellent time-line charting the true history of e-cigarettes and it threw up some interesting facts. vaporizer’ and there’s no further info if this device ever saw the light of day. In 1979 Phil Ray – a computing pioneer – and his doctor Norman Jacobson devised a nicotine delivery device that relied on evaporation rather than a battery. Despite attracting the attention of a handful of retailers Ray said the device was ‘inherently faulty’ and it died a death. The nineties saw an explosion [no pun intended lol] of manufacturers and companies including those behind the Marlboro cigarette brand punting various vaping devices. However it seemed reluctance from regulators – the FDA being one – again saw the interest wane. It wasn’t until 2003 and Hon Lik’s Ruyan e-cigarette that the vaping world as we know it began and since then things have gone from strength to strength. So now as you fill up your tank – build your coil and vape to your hearts content let’s take a moment to salute those vaping pioneers. Without them we’d all be sticking on those patches – sucking on those minty things – chewing on that horrible gum or worse – buying yet another killer packet of tobacco.